Or the One Where: Bart and Lisa help Krusty the Clown reconcile with his estranged father. 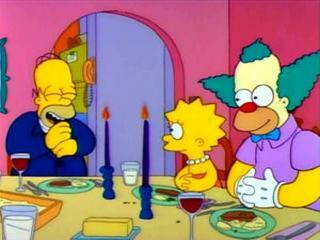 The Setup: Krusty attends a "thank you" dinner with the Simpsons, which reminds him of how much he misses his father. 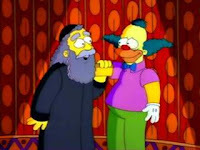 Notable Notes: Krusty's father, the Rabbi Krustofski, appears for the first time, voiced by Jackie Mason. The character will appear infrequently from time to time, usually voiced by Dan Castellaneta, though Mason returned to voice the character for his appearances in seasons fifteen and twenty-one. Mason won an Outstanding Voice-Over Performance Primetime Emmy in 1992 for his performance in this episode. Accordingly, Krusty's Jewish heritage is established for the first time in this episode. Marge: Bart, wipe your feet. Bart: Why bother? They'll just get dirty again. Lisa: Krusty must be Jewish. 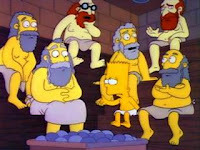 Homer: A Jewish entertainer? Get out of here! Lisa: Dad, there are many prominent Jewish entertainers, including Lauren Bacall, Dinah Shore, William Shatner, and Mel Brooks. Homer: Mel Brooks is Jewish!?! Bart: Krusty, do you think about your father a lot? Krusty: All the time. Except when I'm at the track. Then it's all business. Lisa: A man who envies our family is a man who needs help. Lisa: Bart, we've been going about this all wrong. What's the one thing rabbis prize above everything else? Lisa: No, Bart, knowledge. We're gonna hit him where it hurts, right in the Judaica. Teebore's Take: This sequel to season's one Krusty Gets Busted (Bart's efforts to clear Krusty's name in that episode leads to the thank you dinner that begins this one, and Bart and Lisa team-up in this episode as they did in Busted, this time to reconcile Krusty with his father) reaches back to the early days of American cinema to parody The Jazz Singer, a film about a Jewish singer who leaves his family to make it big (The Jazz Singer is credited as being the first "talkie"). Though it certainly has it's funny moments (Bart and Lisa's quest to out-philosophize the rabbi is much more engaging than Krusty's angst) this is definitely an episode where heart outweighs humor. 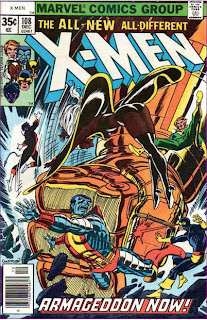 It's an episode I enjoy well enough while watching it, but rarely recall it or seek it out for a rewatch. Krusty's father and his Jewish heritage are introduced, but otherwise an above average episode in the midst of excellent ones. @Falen: The Krusty eps are pretty hit or miss. I like the first one in season one (though that's also technically a Sideshow Bob episode, and most of those are great) and I adore "Homer the Clown" but most of the other ones are pretty meh. The misanthropic clown shtick works a lot better in small doses.